The 140-year saga of the Falls of Clyde appears to be reaching a happy turning point. 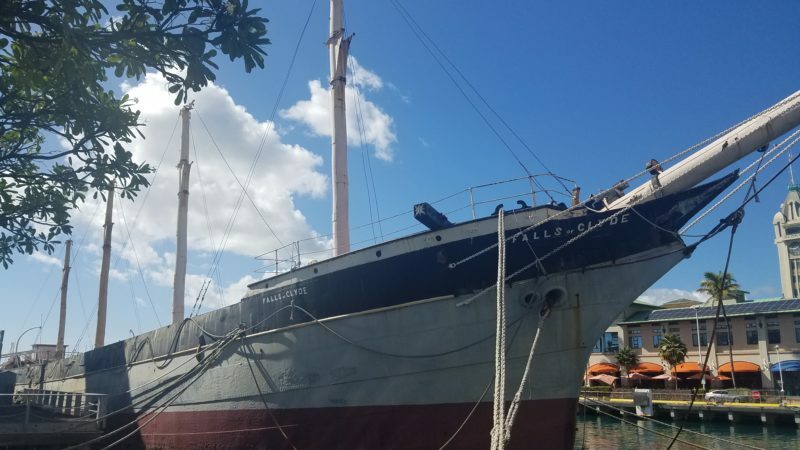 Hawaii’s historic but deteriorated merchant ship, built in Scotland in 1878, will be returned to its original berth-place. Port Glasgow, Inverclyde will welcome the ship home in the spring of 2019. In maritime speak, she’s “rolling home”. She is set to become a living maritime museum in the foggy Scottish waters where she was first launched. 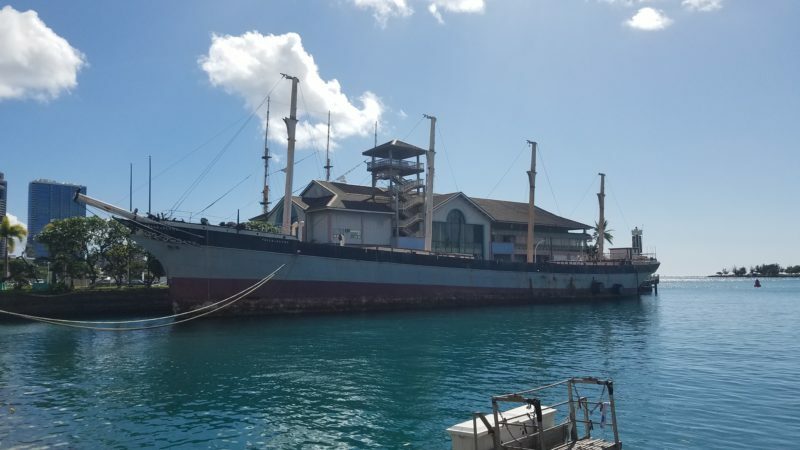 The efforts of a variety of international non-profit organizations and commercial shipping companies have ensured that the last remaining iron-hulled, four-masted merchant ship in the world is homeward bound. Efforts are underway to rebuild the Falls of Clyde and convert it into a floating university classroom and laboratory. Several Scottish universities are involved in its redesign and future as a research vessel. Plans include exploring innovative solar and wind energy science and developing and implementing plastic ocean waste removal. The 280-foot windjammer sailed first from Scotland to Karachi, in what is now Pakistan. The Falls of Clyde first arrived in Hawaii in 1899. Its travels were far and wide. The Falls of Clyde was an unflaggingly reliably transport and cargo ship. After its arrival in Hawaii, the Falls of Clyde ferried sugar east to Asia and oil west to North America. As a “tramp ship”, or vessel with no fixed schedule or port of call, it made calls throughout the Pacific basin as far south as New Zealand. The ship is a vestige of a long bygone world, when pirates and devil seas threatened life and limb with every tide. The Falls of Clyde underwent a series of ownership changes and modifications over the next decades. It found port in Alaska and Washington. The ship fell into disrepair and was scheduled to be scuttled (willfully sunk) in Vancouver as part of a breakwater project in 1963. Last-minute efforts by former crewmen saved the Falls of Clyde, and it was towed to Honolulu. It was given to the Bishop Museum and ultimately opened to the public in 1968. The Falls of Clyde's 4 masts. The Falls of Clyde remained open to the public for many years at Pier 7 at Aloha Tower in Honolulu Harbor. It was a major factor in the opening of the Hawaii Maritime Museum, which conducted regular tours of the old ship. It was home to fundraisers and weddings, to rock concerts and chamber music. A restaurant opened dockside, and the Falls of Clyde became a hot-spot for young Oahuans. But as the old vessel fell into disrepair it was closed to the public for safety reasons. Predictably, business at the museum and adjacent restaurant dried up and both closed as well. The Falls of Clyde was again set to be scuttled in 2008 by its owner Bishop Museum, to serve as an artificial reef. Committed preservation efforts prevailed and the ship remained at it mooring, a ghost ship chained. 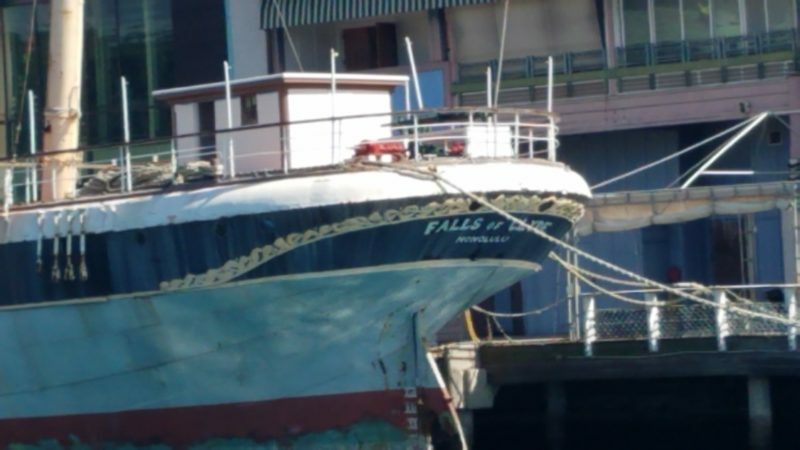 In a valiant effort, the Scottish organization Save Falls of Clyde International and Hawaii’s Friends of Falls of Clyde avoided a 2016 eviction order by the State Harbors Division and set the ship’s repatriation to sail. Notably in 1878, the year the ship was built in Scotland, the United States Senate first proposed women’s suffrage. It was the year that the telephone was first introduced to Hawaii. The first Portuguese immigrants arrived in Hawaii. The Edison Electric Light Company was incorporated. The Falls of Clyde is part of a crucial time in the history of Hawaii and of the world. It is a floating National Historic Landmark. Through the cooperation of local and international organizations and government agencies, the Falls of Clyde is spared a watery grave. Instead, Hawaii’s iconic old stalwart of the open sea will remain a living treasure of the world’s rich and complex maritime legacy.